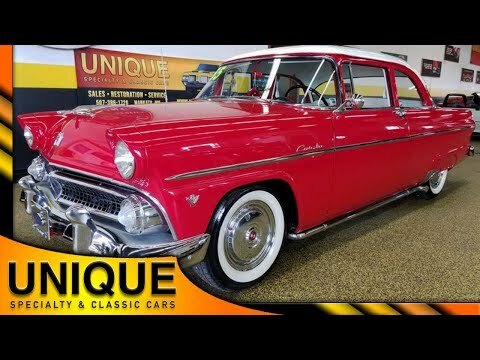 1955 Ford Customline 2dr, VERY solid! TRADES? 1955 Ford Customline 2dr in red. This car is in good condition from the paint to the white top. Riding on wide whitewalls with Silvertown radials. Brightwork and chrome show very nicely on the car. Underneath the hood it retains the 272 Y block V8 that is paired with and automatic transmission. This car also comes equipped with power steering and power brakes to make going down the road very easy. Lake pipes on the side retaining the 50's aesthetic, but are not functional. Dual rear exhaust. Fender skirts equipped on the back. Interior has been redone in red and white vinyl to match the exterior. Interior is very clean including the headliner, door cards, seats, and the carpeting. Shifter on the column. Aftermarket Kenwood stereo added but is easily removable since it is mounted underneath the dash. Great running and driving Customline!